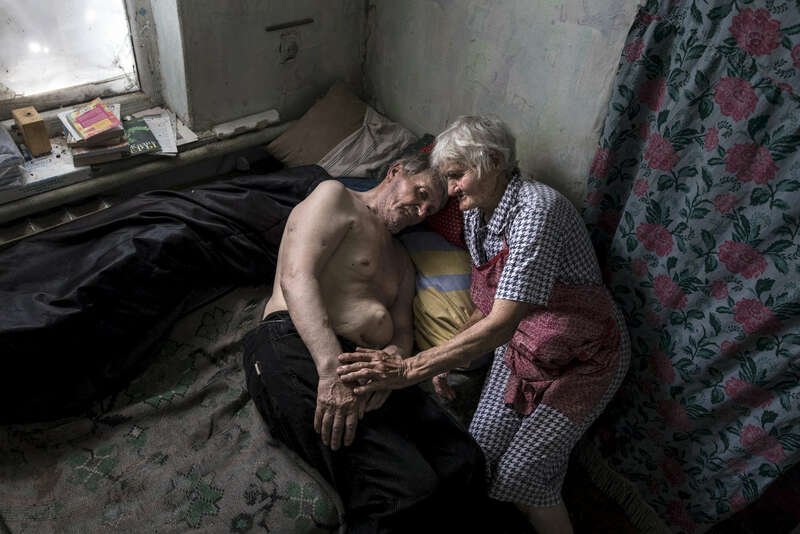 Opytne: Donetsk region: Raisa Petrovna, 80 and her husband Stanislav Vasilyevich live in a village often caught in the crossfire between Ukrainian and Pro-Russian separatists, too close to the contact line. Raisa says that tanks were driving in front of their home in the first year of the war, now they have learned to live with the sound of shelling and gunfire daily. "We were sitting last home, screaming at them not to kill us!" Riasa said. " Her husband was injured twice by shrapnel, once in his abdomen, requiring surgery. He suffers from a hernia that keeps on growing. Stanislav suffers from dementia now along with his other medical issues. " I have to treat him as a child, I am so sorry that he is like this now, I am afraid to leave him even for a moment. ;" Raisa stated. Their two sons live on the other side of the contact line unable to visit often because of the war. Their village, Opytne depends on humanitarian organizations to help the elderly who refuse to leave their homes and are trapped in a dangerous situation.